Sourdough waffles are full of flavor, tender as can be and oh so good! So go ahead and break out the syrup and warm up those waffle irons! There have been a couple of factors that have lead to a sharp increase in the number of waffles eaten in our house. I bought a Belgian waffle maker. There is just something so much more fun about a Belgian waffle. The deep wells leave plenty of room to catch all of the good stuff and there is more room for a crisp exterior and soft interior. We have a sourdough baby that loves to be fed. Luckily our new housemate, Bertha, also loves to make delicious food. She has made quite a few batches of muffins, plenty of bread, even some pasta. But the freezer is full of muffins, the freezer is full of bread and though we have a lot of fun making pasta we can't really go through the whole process on a weekly basis. Luckily Jax loves getting a muffin out of the freezer and warming it up for breakfast. I love toasting a slice of homemade bread from the freezer and frying an egg to put on top for lunch. I am sure we will make more pasta when winter rolls back around. In the meantime... we have been making waffles!! This recipe is our favorite ratio of ingredients. We have tried to mess around with it some including adding more eggs, which I think would make good pancakes but made wimpy waffles. In the end this is the recipe we love. You can easily extend it by adding an extra cup of flour and buttermilk to the sponge, then you get closer to 14 waffles. It is best if you let the sponge sit overnight, but we have had really good results just letting it sit for a few hours as well. Just stick it in a warm spot and let the sourdough go to work! These waffles are not very sweet on their own. The sugar gets eaten up by the sourdough during the fermentation. So they would work pretty well for savory applications. They get a nice crust and are soft and delicious inside. We have had them with syrup, but we love them with fruit. Our last decent harvest of blackberries was cooked down with a bit of maple syrup for a batch and I made a peach vanilla sauce I'll be sharing with you later this week that was excellent on waffles. I think they'd make an excellent base for some scrambled eggs and sausage gravy too. We will have to try that soon and report back to you! 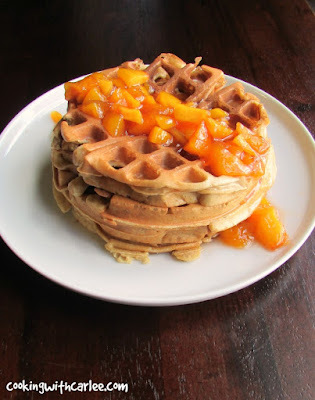 What are your favorite waffle toppings and have you ever made sourdough waffles? Stir together the sponge ingredients, cover and allow to sit at room temperature overnight. In a small bowl, beat together the batter ingredients. Stir into the sponge. Grease and preheat your waffle iron. 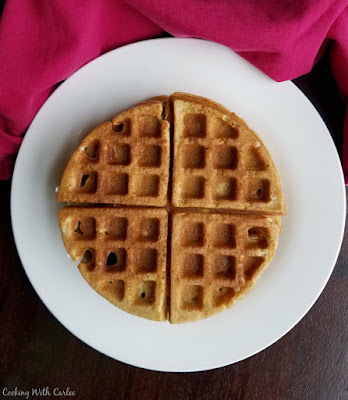 Ladle batter into waffle iron and cook according to the iron's instructions. Waffles are best served immediately but can be held in a warm oven if needed. Yes, yes, and yes!! 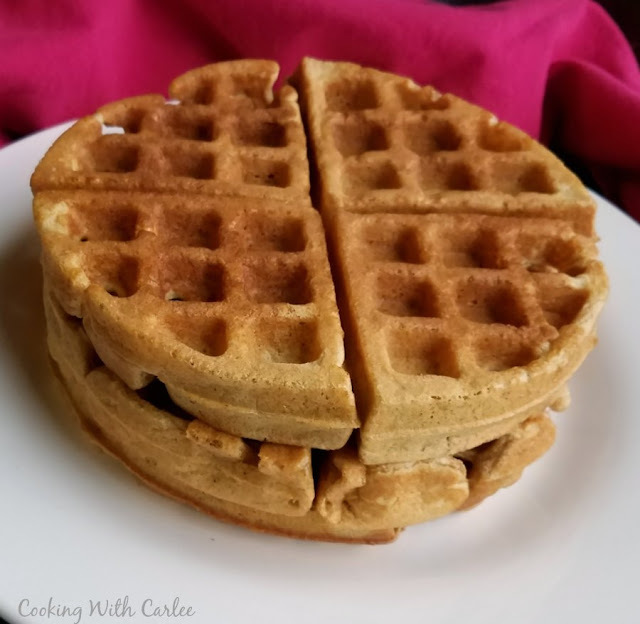 I have been craving a good waffle and these are it!! OH I wish they would magically appear in from of me right now, lol!! Yum with the sourdough for sure!! Ever since I got the new waffle maker, everything has to go in there! But these are the far and away favorite. Jax has been begging for waffles, so I have to make them right? If only you were a little closer, we'd happily share! Oh no! That is too funny (and sad!) that it got cooked. 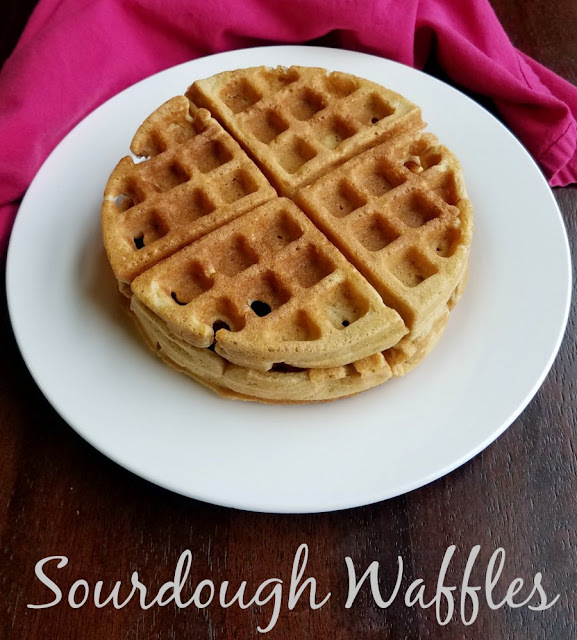 We love these waffles, but I also have some sourdough muffin recipes on here that we are addicted too. Then there is the sandwich bread. All good stuff!! I definitely thought of you as I was making them. It looked like something you would love other than the gluten of course! You've been teasing me with all of your yummy looking treats, so I had to do it!